Extending U.S. trade preferences for Haiti could create as many as 100,000 jobs that would boost the earthquake-ravaged country's recovery, former President Bill Clinton said during a visit to the Haitian capital Monday. The five most popular stories on CNN.com during the last 24 hours, according to Newspulse. - ‘Baby killer’ shouted: While addressing the House, Rep. Bart Stupak was called a "baby killer." - Health care bill passes: House lawmakers pass a health care overhaul bill by a 219-212 vote. - Texas lawmaker: I yelled 'It's a baby killer': Texas Rep. Randy Neugebauer says he was the Republican House member who called out "baby killer" during the chamber's debate Sunday night on the health care reform bill. - Where does health care reform stand? The House on Sunday passed the Senate's health care reform bill and a package of measures meant to reconcile differences between the Senate bill and the one it passed last year. - How the health care bill could affect you: Americans will see some immediate changes when President Obama signs the new health care bill into law Tuesday. For the first time, a CNN poll has found that a majority of Americans disapprove of President Obama's job performance. According to a CNN/Opinion Research Corporation poll released Monday, 51 percent of respondents disapprove of Obama's job performance and 46 percent approve of it. [Updated, 8:22 p.m.] Murray, the pop star's personal physician, has been charged with voluntary manslaughter in Jackson's death on June 25, 2009. The Los Angeles coroner concluded Jackson died of "acute propofol intoxication." Murray told investigators he gave Jackson propofol, a powerful anesthetic, to help him sleep. The defense spokeswoman said "we can only assume" the investigation report was leaked by prosecutors since it was not done by the defense. Attorney General Eric Holder finally sent his answers from a November hearing to Senate Republicans Monday, on what was presumed to be the eve of an expected showdown between Holder and the GOP lawmakers over plans to close Guantanamo Bay prison and put detainees on trial in civilian courts. The community organizing group ACORN announced Monday it is closing its operations. The announcement came after the board of the Association of Community Organizations for Reform Now met Sunday and approved the steps required "to responsibly manage the process of bringing its operations to a close over the coming months," an ACORN statement read. A key banking panel took only minutes Monday to approve a sweeping regulatory reform measure aimed at warding off future collapses in the financial system. The Senate Banking Committee voted 13-10 in favor of the bill put forth by panel chairman Sen. Christopher Dodd, D-Conn., moving it to the full Senate just after Dodd gaveled the hearing to order at 5 p.m. ET. Stocks gained Monday, with health care shares leading the way, as Congressional approval of a sweeping reform bill removed the uncertainty that has surrounded its passage for months. Despite one of the worst economic climates in recent history, the number of bank crimes fell sharply last year, the Federal Bureau of Investigation said Monday. The Army is a big step closer to moving Fort Hood shooting suspect Maj. Nidal Hasan to a jail just 19 miles from the scene of the November massacre that left 13 people dead. 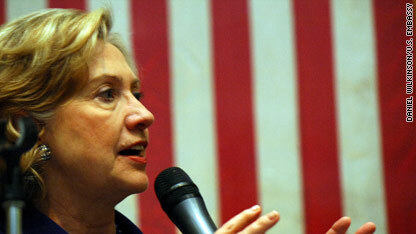 Secretary of State Clinton will lead a high level U.S. delegation to Mexico City. President Barack Obama plans to sign the health care bill during a White House ceremony. At that point, the U.S. Senate can begin dealing with the process of reconciling its version of the bill with one passed late Sunday by the House of Representatives. Secretary of State Hillary Clinton, Defense Secretary Robert Gates, Homeland Security Secretary Janet Napolitano, and other top U.S. officials will be in Mexico City to discuss the ongoing war on drugs. It will be a major show of solidarity with the Mexican government since the killings of a U.S. consulate worker and her husband who was also an American. They were gunned down earlier this month in Ciudad Juarez in front of their 1-year-old child. Dr. Amy Bishop is scheduled to be in court to face charges linked to last month's deadly shooting at the University of Alabama-Huntsville. The former biology professor is charged with one count of capital murder and three counts of attempted murder after allegedly shooting six colleagues, three fatally, on Feb 12. Texas Rep. Randy Neugebauer says he was the Republican House member who called out "baby killer" during the chamber's debate Sunday night on the health care reform bill. Ten states plan to file a federal lawsuit challenging the constitutionality of the new health care reform bill, Florida's attorney general announced Monday. In a long-awaited announcement, Google said Monday that it will stop censoring search services on google.cn, its Chinese search site. Google said it is now redirecting its Chinese users to Hong Kong site google.com.hk, which offers uncensored search results, according to its company blog. Pakistani police have foiled a plot by militants to attack several locations in Islamabad frequented by foreigners, Islamabad Police Chief Bin Yamin told CNN. [Updated at 1:53 p.m.] A U.S. official told CNN that the warning was issued due to information that al Qaeda individuals in Yemen were attempting to acquire a small boat and launch an attack on a commercial vessel. [Posted at 8:51 a.m.] Military and commercial maritime traffic sailing off the coast of Yemen are being warned by U.S. intelligence they may be targeted by al Qaeda. Hockey's got a Stanley Cup rematch tonight that feature two of the best against each other -- the Penguins and Red Wings. -Yankees vs. Phillies (1:00 PM, ESPN) Last year’s World Series representatives seemed poised for another big year. A.J. Burnett will start today for the Yankees but look for Phil Hughes to get work as well. Hughes is competing for the final rotation spot for the depending champs. Cole Hamels, Danys Baez, Ryan Madson and David Herndon are scheduled to pitch against the Yankees. The grandson of former Iranian President Hashemi Rafsanjani has been arrested, Iran's semi-official Fars News Agency reported. Hassan Lahouti was arrested Sunday night as soon as he arrived at Tehran's Imam Khomeini International Airport, the report said. He was taken to prison, it said. Lahouti left Iran 10 days after Iran's June elections and had been staying in London ever since, the report said, adding that he had been planning a trip with his family to the Iranian island resort of Kish when he was arrested. Rafsanjani is a powerful reformist figure who has spoken out against President Mahmoud Ahmadinejad's hard-line regime. The European Union Naval Force Somalia rescued the crew of an Iranian vessel after they had been left to die by Somali pirates, officials said Monday.